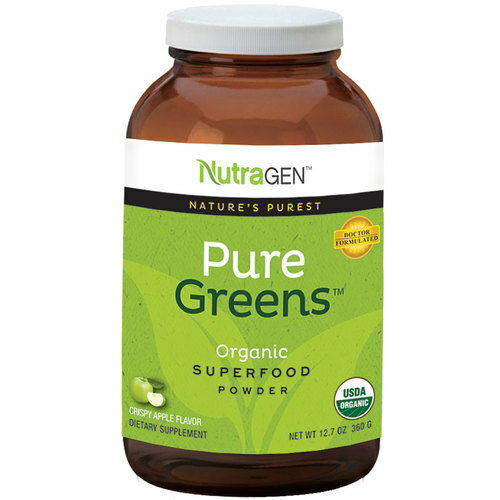 Pure Greens from NutraGEN is packed full of whole food vitamins and minerals. Advertências: Do not use if safety seal is missing or broken. Consult your Health Care Practitioner before taking this product if you are pregnant, nursing, anticipate surgery, take medication or are under medical supervision. These statements have not been evaluated by the Food and Drug Administration. This product is not intended to diagnose, treat, cure or prevent any disease. Keep out of reach of children. Do not take more than recommended dosage. Recomendações de uso: Mix 1 heaping tablespoon directly into 8 to 12 ounces of water or your favorite beverage. Blend, shake or briskly stir until fully dissolved.